Not every Marvel property is a "super hero." In fact, certain characters in the Marvel Universe stand out amongst the usual colorful and powerful cast of characters like Spider-Man and Iron Man. The Punisher has always been about a dark and tragic tale, about a man who's life was ripped from him, therefore giving him nothing to lose. It's surprising that such a violent and dark setting hasn't yielded more video games. Alas, we've been left mostly barren of game's starring Frank Castle. Punisher: No Mercy is a downloadable game for the PlayStation Network built by Zen Studios - but is it better than nothing? I guess when you attach a $10 price tag to a downloadable Unreal Engine title, there's certain expectations you might have. While I wasn't expecting something of a full quality retail shooter - I was expecting something with a little more substance. The game literally throws you into a Punisher story with little to no background, and a full cast of characters making their appearance from the comic books. The "campaign" mode is split up between missions by comic book pages used to progress the story. The missions themselves, well they aren't much more than an arena based shooter with different objectives. 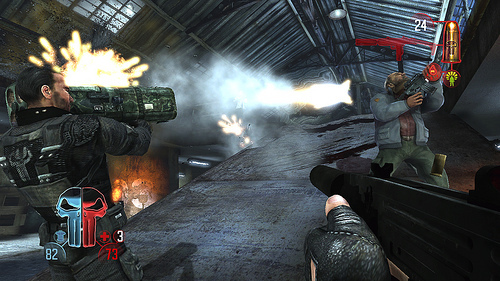 This mode can be played solo, or in a two player cooperative style. These missions range from kill 150 bad guys to kill 150 bad guys in 10 minutes to kill 150 bad guys in 7 waves. Yeah...there's not much variety here. On top of that, the AI is completely idiotic, making straight lines to whatever player is closest to him. They tend to bunch up in doorways making for easy killing. Killing enemies yields weapon and player upgrades including more armor, bigger clips, more firepower and laser sights. After completing the missions you'll also unlock more characters to use in multiplayer, as well as new guns and perks. Honestly, this game is border-line "co-op." Sure there's two people in the same mission working towards the same goal, but I just never felt this sense that we were actually working together. The fact that arena style matches break up the prose just seem odd. Especially when they throw some odd drug induced level where you fight dozens of clones of bosses you killed, and even clones of the Punisher himself. It's incredibly difficult to stay together as well as most maps contain tight corridors and winding alleys. It was rare that I actually felt like my partner was there, and if it wasn't for an increasing kill count, I probably would have forgotten. It'll take you about three hours to play through the campaign, and by the time it's over you'll be a bit bored of the gameplay. The only incentive to continue into multiplayer or give it another playthrough is to use the unlocks - otherwise there's very little replay value here. 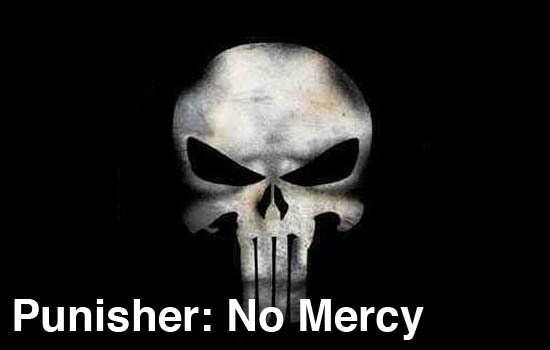 For the most part Punisher: No Mercy is a wasted oppurtunity on a great franchise. The Co-Op Experience: Play co-op through the game's 4 to 5 hour campaign. Page created in 1.8149 seconds.